This post is brought to you in collaboration with Unilever, all opinions are my own. Summer is slowly coming to an end, and that can only mean one thing, football season is just around the corner. While the boys love football, it seems everything else takes second place to keeping up with their favorite teams. That means that their hygiene come game day may not always be the best. What can you do with teenagers though? Well, you can draft some help from DeMarco Murray and get the men in your life excited about getting game day ready with the official products of the NCAA. 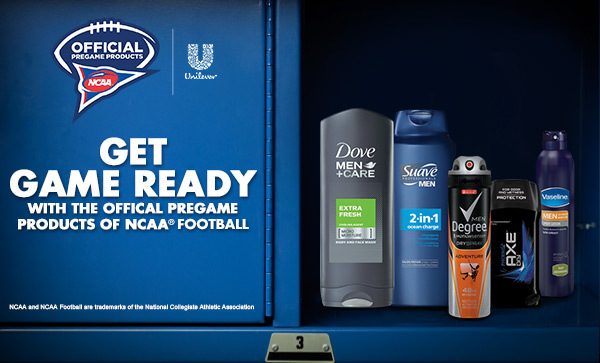 Unilever wants to help every man get game day ready this football season with the official pre-game products of the NCAA. I know that telling my teenage boys that they can get ready for game day the same way DeMarco Murray does encourages them to have better hygienic habits. Now, some of their products can help them look good both on and off the field. I love my boys dearly, but they definitely need a strong line of defense when it comes to deodorant. That's where Degree Men Sport Defense Spray comes in, it sprays on fast and keeps them smelling their best all day long. One product I never have to remind my boys to use is the AXE Phoenix Shower Gel. A quick jump in the shower, and they have the confidence to face whatever the day may bring. A new product that we are trying this game day season is the Dove Men+Care Extra Fresh Body and Face Wash. With the onset of puberty has come an increased need to keep their face washed and free of blemishes, so we're calling in the big guns with this product. 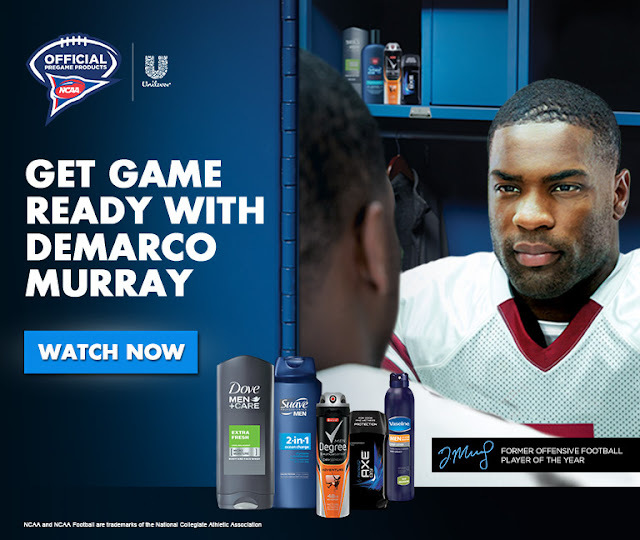 To see a full line-up of products to help the men in your life get game day ready, as well as exclusive content featuring DeMarco Murray, visit UnileverGetGameReady.com. Want a chance to help the men in your life get game day ready with these and other great Unilever products? Enter the giveaway below to win a product prize pack! To enter, visit UnileverGetGameReady.com, and send a tweet to me @KBunn using the #GetGameReady hashtag letting me know what you learned about DeMarco Murray or Unilever products on the site. Giveaway ends 8/7/15 and is open to US residents 18+.